[NOV 24-25 | SAN ANTONIO] It was a tale of two completely different days over Thanksgiving weekend on the Canyons Course at TPC San Antonio, as over 100 of the best junior golfers in the region took advantage of calm, mild temperatures in Round 1 and then fought to survive in Round 2 as 25+ mph winds and plummeting temperatures ripped through the golf course. 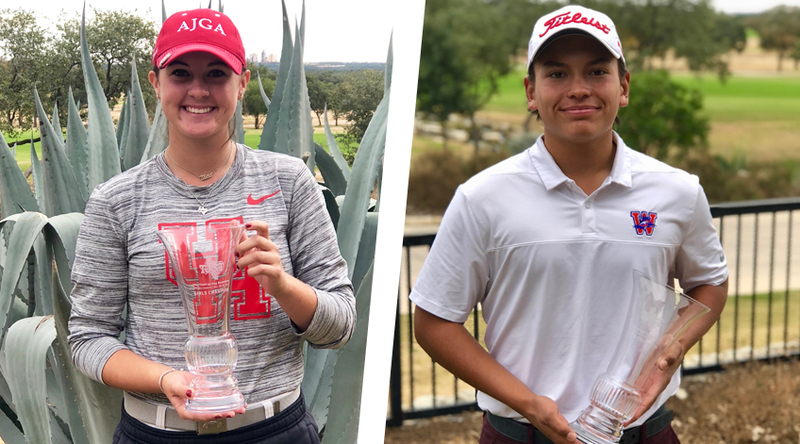 But despite the paralyzingly difficult Round 2 conditions, the cream of the crop rose to the top as Austin Westlake freshman Jacob Sosa and TMI Episcopal junior Delaney Martin captured the titles at the 2018 Thanksgiving Showdown. Martin, a current University of Houston golf commit, put up one of the most impressive overall rounds of the tournament on Day 2, firing an even-par 72 that felt more like a 4- or 5-under round. During the middle of the front 9, Martin made birdies on No. 5 and No. 7, along with a par on No. 6, playing the hardest stretch on the golf course in 2-under-par, pulling her into a tie for the lead as she stood on the 8th teebox, after starting the day five shots back of Round 1 leader Hanna Liu. Martin made the turn at 1-over for the day and still tied for the lead with young phenom Avery Zweig. On the back 9, Martin went on a tear, birding three holes in the 5-hole stretch, and took a commanding lead of the tournament when her birdie putt dropped on the difficult par-3 16th hole. Martin made par on 18 to post even par for the day and 4-over for the tournament, and it took a Herculean birdie by Zweig on 18 to tie at the top and force a sudden death playoff. On the first playoff hole, Martin hit her approach shot to about 60 feet and left her birdie putt well short of the hole. With Zweig in for bogey, Martin slammed in her par putt to capture the victory. Rounding out the Top 3 in the Girls Division was Lake Travis senior Hanna Liu, who finished five shots back of Martin and Zweig. In the Boys Division, Hebron High School junior Daniel An opened the tournament with a 3-under-par round to take a three-shot lead on the first day. An’s round was feast or famine, as he made six birdies on the front 9 – including four in a row from No. 5 to No. 8 – and added another two on the back 9, but paired that with a double bogey on No. 11 and three additional bogeys. He stood three shots clear of Sosa, who opened the tournament with an even-par round, and an additional shot clear of Austin’s Prayaag Oruganti, who shot 1-over. The final round forced players into survival mode, where making a par often gained a half- or full-shot on the field on any given hole. Sosa played a relatively clean front 9, making 8 pars and only 1 bogey (when the field averaged almost 7-over on the front 9 for the day), but was up-and-down on the back side, as he made two birdies and three double-bogeys. An was solid in the blustery conditions in the early half of his round, as he played his first nine holes in only 1-over-par, but the treacherous cross winds that whipped through his final 9 holes proved to be too difficult, as An made six bogeys on his final eight holes while Sosa made pars, resulting in a 1-shot victory for the Westlake freshman and a second place finish for An. Rounding out the Top 5 were Katy’s Byong-Ho Lee and UTSA signee (and 2017 Thanksgiving Showdown champ) David Harrison, who both finished T3, and Lake Travis senior Sean Rabbit, who shot a lights-out 1-under 71 in the final round to vault up into 5th place. For their efforts, Rabbit and Martin took home the “Low Final Round” awards, and Lubbock’s Preston Defriend and Southlake’s MaKayla Tyrrell took home the “Biggest Move” awards. For more photos from the tournament, view the album on the TJGT Flickr page.